Nelson Rockefeller (born July 8, 1908 in Bar Harbor Maine, died January 26, 1979 in New York, New York) was Vice President of the USA under President Gerald R. Ford from 1974-1977. He was also Governor of New York, and ran unsuccessfully for the Republican presidential nomination in 1960, 1964, and 1968. He was a liberal Republican. He graduated from Dartmouth College in 1930. He married Mary Todhunter Clark on June 23 of that year, a few days after his graduation. Together they had five children. He divorced her in 1962 and the following year married Margretta Fitler Murphy and he had two children with her and remained married to her until his death in 1979. He was also a prominent businessman and liberal Republican politician. He was the son of industrialist John D. Rockefeller, Jr. and the grandson of Standard Oil's founder and owner John D. Rockefeller. He was also the maternal grandson of USA Senator Nelson W. Aldrich of Rhode Island. He was an adviser to President Franklin Roosevelt during World War II and headed office of Coordinator of Inter-American Affairs (CIAA). After the war he continued as an adviser to President Truman and helped him to develop anti-communist geopolitical programs during the Cold War such such as Point Four. He also was an adviser to President Eisenhower. He left the Eisenhower administration eventually, though. In 1958 he won his party's nomination to be governor of New York and proceeded to win the general election against Democratic incumbent Averill Harriman in an otherwise Democratic year. He unsuccessfully sought his party's presidential nomination in 1960 but withdrew from the race when it became clear that Richard Nixon would win the nomination. He campaigned for Nixon in the general election campaign. But Nixon still lost to Kennedy. In 1964 Rockefeller again sought the Republican presidential nomination but lost to conservative USA Senator Barry Goldwater of Arizona. Rockefeller backed Goldwater in the general election, but with more caution than he had supported Nixon. Rockefeller refused to publicly campaign with Goldwater. In 1968 Rockefeller again sought his party's presidential nomination but lost to Nixon. He then supported Nixon wholeheartedly in the general election. After Nixon resigned because of the Watergate affair and Vice President Ford became president, the new president appointed Rockefeller vice president, before there was a competition between Rockefeller and George Bush to persuade Ford to pick them for the Vice Presidency. 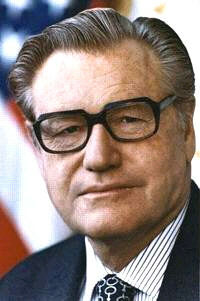 Rockefeller was replaced by USA Senator Robert Dole as the Republican party's vice presidential nominee in 1976, due to opposition by conservatives to Rockefeller. He campaigned for Ford and Dole, but after the campaign he retired. He died of a heart attack in 1979. The Life of Nelson A. Rockefeller: 1908-1958: Worlds to Conquer by Cary Reich. This page was last modified on 13 November 2017, at 17:30. This page has been accessed 22,302 times.